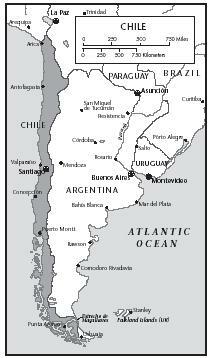 Chile is located along the southwestern coast of South America. 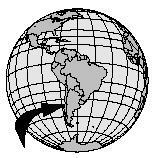 Chile is a 2,653-mile-long, skinny string of land, averaging just 109 miles wide. The country has the rugged Andes Mountains in the east and another lower mountain range along the coast of the Pacific Ocean. Between the two mountain ranges lies a fertile valley where Chile's agricultural activity is centered. Around the main cities such as Santiago, the capital, and Rancagua, there is air and water pollution. Chile's main environmental problem is deforestation (clearing of forestland by cutting down all the trees), which leads to soil erosion. Chilean farmers do not grow enough crops or raise enough livestock to feed the country's population. Food must be imported, which is very expensive. The Spanish came to Chile in 1541 and they brought grapes, olives, walnuts, chestnuts, rice, wheat, citrus fruits, sugar, garlic, and spices. They also brought chicken, beef, sheep, pigs, rabbits, milk, cheeses, and sausages. Long before the Spanish came to Chile, the native Amerindians used corn in many of their dishes. The combination of the Spanish and Amerindians' foods formed popular corn-based dishes that are still part of the typical diet in the twenty-first century. Popular dishes include humitas (corn that is pureed and cooked in corn husks) and pastel de choclo (a corn and meat pie). In 1848, many German immigrants came to Chile, bringing rich pastries and cakes with them. Italian and Arab immigrants also settled in Chile, along with other European immigrants. Each group brought its style of cooking to Chile. The Italians brought ices and flavored them with the different Chilean fruits. The Arab immigrants brought their use of certain spices and herbs, and the combination of sweet and salty tastes. Between 1880 and 1900, British immigrants brought tea to Chile. Teatime—inviting friends over for tea and coffee—continues to be enjoyed in modern Chile. Chileans serve té con leche (tea with milk). Heat 2 cups of water to boiling. In a saucepan, heat the milk just to boiling, and remove from heat. Place tea bags into 2 separate cups. Pour the water into cups, filling ⅓ of cup. Let the tea steep (soak) for 5 minutes, then remove bag. Fill the rest of the cup with the hot milk. Recipe may be doubled or tripled, to serve more guests. Chile has a wide variety of foods, including seafood, beef, fresh fruit, and vegetables. A traditional Chilean meal is pastel de choclo , a "pie" made with corn, vegetables, chicken, and beef. This dish is usually served with ensalada chilena (Chilean salad). Place the sliced onions in a bowl. Cover with cold water and let set for 1 hour, then drain the water. Mix onions with the tomatoes on a large platter. Pour oil and lemon juice on mixture. Mix and serve with chopped cilantro sprinkled on top. Heat the corn, basil, salt, and butter in a large pot. Slowly add the milk, stirring constantly until the mixture thickens. Set aside while the meat filling is prepared. Fry the onions in oil until they are soft. Add the ground meat and stir to brown. Add salt, pepper, and ground cumin. Use an oven-proof dish to prepare the pie. Spread the onion and ground meat mixture on the bottom of the dish, then arrange the olives and raisins on top. Place chicken pieces over the top. Cover the filling with the corn mixture, then sprinkle on the confectioners' sugar. Bake in the oven for 30 to 35 minutes until the crust is golden brown. A typical Chilean dish is cazuela de ave , a thick stew of chicken, potatoes, rice, green peppers, and, occasionally, onions. Humitas are a national favorite, and they come from the Amerindians who are native to Chile. Humitas are made with grated fresh corn, mixed into a paste with fried onions, basil, salt, and pepper. The mixture is then wrapped in cornhusks and cooked in boiling water. 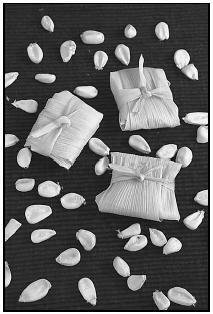 Corn husks wrap humitas, a favorite snack. Inside is a paste of grated corn seasoned with onions, herbs, salt, and pepper. Empanadas , little pies usually stuffed with beef, olives, and onions, are another favorite. A popular dish is bistec a lo pobre (poor man's steak), which is steak topped with two fried eggs, and served with fried onions and French fries. Despite the name, poor Chileans cannot afford to eat this meal because beef is very expensive; this dish is actually eaten by wealthier people. Tomaticán (tomato and corn stew) is often served as a side dish with meat, chicken, or fish. In a large saucepan, cook the onion and garlic in hot oil. Add the tomatoes and cook, covered, for 5 minutes. Add the corn and cook for another 3 minutes. Add salt to taste, sprinkle parsley on top. About 90 percent of Chileans are Roman Catholic, the religion that the Spaniards brought with them when they came to Chile in 1541. For Christmas, which occurs during the summertime in the Southern Hemisphere, families decorate Christmas trees, and on Christmas Eve they gather to eat a late meal. After the families eat, they open presents. Children enjoy pan de pascua , a Christmas cake made with fruits and nuts that comes from the German influence in Chile. During the holiday season, family and friends drink cola de mono (Chilean eggnog). Bring the milk to a boil with the sugar, vanilla, and coffee. Let it simmer slowly, stirring occasionally, until the milk turns a light brown. Remove from the heat, strain, and return to low heat. Add a couple of Tablespoons of the hot milk to the egg yolks to dilute and warm them. Stir the yolks back into the mixture and cook for about 3 to 5 minutes. Let it cool completely before drinking. Chileans also drink eggnog on New Year's Eve, celebrated on December 31. This is a favorite holiday. At midnight, Chileans hug and kiss each other, saying (in Spanish), "Good luck and may all your wishes come true." Some believe they will have good luck if they eat lentejas (lentils) at midnight. Because many Chileans are Roman Catholic, days named after saints are important holidays. Children often celebrate the saint's day with the same name as theirs. October 4 is St. Francis of Assisi's day. Girls named Francisca and boys named Francisco celebrate this saint's day with a party and cake, as if it were their birthday. They also celebrate their own real birthdays. At both celebrations, torta de cumpleaños (birthday cake) is served. Simmer the milk in a saucepan for 5 minutes and cover. In a large mixing bowl, beat the egg yolks with the sugar until the mixture is light yellow. Stir in flour, and pour the hot milk over the egg mixture, beating continuously with a whisk. Pour the mixture back into saucepan and bring to a slow simmer, stirring constantly. Lower the heat and cook for 2 minutes, stirring quickly. Add vanilla extract, and pour the cream into a bowl and spread melted butter over it. Once the cake is cool, remove from the pans. In Chile, each layer would be sliced horizontally into two separate layers, so that the cake has 4 layers in all. This is an optional step; the cake will taste almost the same with just two layers. Place one layer of cake on a plate, spread some pastry cream or frosting on it and follow with a layer of jelly. If using more than two layers, alternate jelly and pastry cream or frosting between layers of cake. Cover the top and sides of the cake with the remaining cream. Let the cake sit overnight before eating. 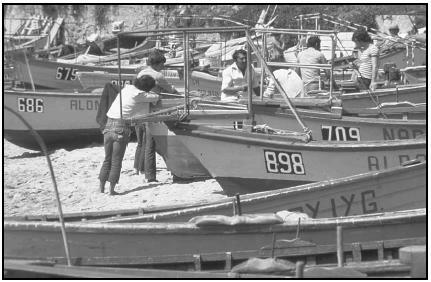 Chile's long coastline provides ample opportunities for fishermen to gain access to the sea. Chilean cooks will often offer at least one dish featuring seafood for lunch and dinner. Mealtimes are an important part of family life. Families almost always eat together at home, only going to a restaurant on a special occasion. Mothers prepare a light breakfast of toast and milk for their children. Lunch is the biggest meal of the day, and two main dishes are often served. The first dish might be a salad with seafood. The other dish might be cazuela de ave , a thick stew of chicken, potatoes, rice, green peppers, and, occasionally, onions. Chancho en Piedra (Chili and Tomato Spread) is often served with bread as an accompaniment to meals, or may be eaten by students as a snack. In small towns, businesses close for almost three hours so people can go home and eat lunch with their families and take a siesta (nap). Gradually add the tomatoes, mixing them well. Pour mixture into a small serving bowl. Spread on slices of crusty bread or toast. Sandwiches are a popular snack. Children can also take sandwiches to school for lunch. One popular ham and melted cheese sandwich is called Barros Jarpa , named after a Chilean who ate large amounts of these sandwiches. Place one slice each of ham and cheese on a slice of bread and place the other slice of bread on top. Toast the sandwich in the pan on both sides until the cheese melts. Restaurants range from snack bars to expensive restaurants. A favorite Chilean "fast food" meal is a completo , which is similar to a hot dog and typically accompanied with mustard, avocado, tomatoes, and mayonnaise. Ponche (Chilean punch) is a traditional and popular beverage. 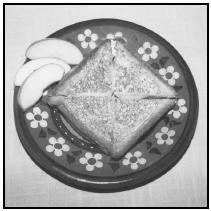 Barros Jarpa (grilled ham and cheese sandwich), served with fruit, is a common lunch for students. In a pot, simmer the cranberry juice with the cinnamon, nutmeg, cloves, and the lemon and orange peels for 15 minutes. Let it cool and throw away the cloves and fruit peels. Chileans also invite friends for teatime, a tradition from the British immigrants who came to Chile in the late 1800s. Dinner is usually one main dish. For dessert, Chileans eat fresh fruit, ice cream, or other desserts such as arroz con leche (rice pudding). Put the rice and water in a medium-size saucepan and bring to a boil over medium-high heat. Reduce to low heat and cover the pan. Cook the rice for about 20 minutes, or until tender. In a medium bowl, stir the milk, eggs, sugar, vanilla extract, and lemon peel until blended. Add the rice and stir gently until all ingredients are well mixed. Butter a 9-inch pie pan and spoon the mixture into it. Bake for 25 minutes. Remove pudding from the oven, stir it, and cool for 15 minutes. While the pudding cools, beat the heavy cream in a large bowl until it forms soft peaks. Fold the rice pudding into the whipped cream. Serve in a dish, warm or chilled, and sprinkle with cinnamon. 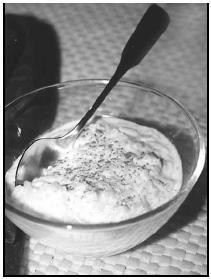 Arroz con Leche (rice pudding) may be served warm or chilled. A sprinkle of cinnamon adds just a hint of spice to complement the lemon peel in the pudding. According to a report by the World Bank, about 5 percent of the total population in Chile is undernourished, a decrease from nearly 15 percent in the early 1980s. A small percentage of children under age five show signs of malnutrition, such as being underweight or short for their age. Protein deficiency among the general population has induced an abnormally high rate of congenital (existing at or before birth) mental disabilities. Between 1994 and 1995, almost everyone had access to safe water and health care services. One section of Chile's public health care system is called the National System of Health Services. It helps to provide periodic medical care to all children under six years of age not who are not enrolled in alternative medical plans. Through this program, low-income mothers can receive nutritional assistance for their children and for themselves. As a result of this program, the incidence of moderate to severe childhood malnutrition among those receiving assistance has been significantly reduced. Bernhardson, Wayne. Chile and Easter Island: a Lonely Planet Travel Atlas . Hawthorne, Vic, Australia; Oakland, CA: Lonely Planet Publications, 1997. Chile . Boston: APA Publications, 1996. Galvin, Irene Flum. Chile: A Journey to Freedom . Parsippany, NJ: Dillon Press, 1997. McNair, Sylvia. Chile . New York: Children's Press, 2000. Novas, Himilce and Silva, Rosemary. Latin American Cooking Across the U.S.A. New York: Knopf, 1997. Nurse, Charlie. Chile Handbook . Lincolnwood, IL: Passport Books, 1997. Umaña-Murray, Mirtha. Three Generations of Chilean Cuisine . Los Angeles: Lowell House, 1996. Van Waerebeek-Gonzalez, Ruth. The Chilean Kitchen: Authentic, Homestyle Foods, Regional Wines, and Culinary Traditions of Chile . New York: HPBooks, 1999. Embassy of Chile-USA. "Cultural Documents" [Online] Available http://www.chile-usa.org/culturaldocu.htm (accessed March 19, 2001). SOAR: Searchable Online Archive of Recipes. [Online] Available http://soar.berkeley.edu/recipes (accessed March 1, 2001). "Chilean farmers do not grow enough crops or raise enough livestock to feed the country's population. Food must be imported, which is very expensive." That's not true, because farmers can provide the population enough food, but is much cheaper bring some products from Argentina and Brazil. Actually food is very cheap, but now is a little expensive because the oil prices increased a lot. Ensalada Chilena doesn't have lemon juice, never! Corn in Pastel de Choclo is pureed joined to basil. There are 1-2 olives per serve, and 2-4 raisins per serve. Also you put some boiled egg in slices. Tomatican is not made with parsley, but basil. It's served with boiled potatos. Just a few people celebrate the saint's day because catholic church is decreasing because the raising of iglesia evangelica, a kind of demagogical protestant church. And birthday cake is and old recipe, just a few people make their own cakes, is most ofen buy them at supermarket (cake with pineapple and cream). There is another sandwich wich is much more important than barros jarpa, is Barros Luco, because the president Barros Luco always had a sandwich of beef and melted cheese. This sandwich was born on Confitería Torres, a famous restaurant wich is still on Alameda Av. crossing Dieciocho St. I think you confused the Barros Jarpa and Barros Luco. Arroz con leche doesn't have eggs, and instead of lemosn peel is orange peel. To make arroz con leche you have to cook rice in some milk with sugar cinnamon, clove and orange peel. It must be creamy, sweet and cold, and it never goes to oven. I loved this and it helped me a ton with my school project! Thanks so much for posting these recipes!